A new study confirms what we already know too well: Sprawl is expensive. The New Climate Economy’s latest report [PDF] attempts to put a figure on it and it’s pretty staggering: more than $1 trillion a year nationwide. That figure accounts for higher costs to individuals and communities associated with sprawling development patterns, including transportation infrastructure, less efficient city services, increased pollution, greater vehicle expenses, more traffic collisions, and reduced health outcomes. In order to arrive at those figures, researchers separated U.S. communities into five groups, based on how relatively sprawling they were. At one end of the spectrum, where development was most dense, there were about 9.5 residents per acre. The third quintile represented average U.S. housing density, while the fifth was the most sprawling, at less than two residents per acre. Researchers compared the costs borne by those in the most sprawling communities to those in the least sprawling. Existing studies estimating the increased costs of sprawl were used as the basis for the economic comparisons. For example, they found that infrastructure costs per capita were $502 in the smart growth quintile but $750 per capita in the most sprawling. The report also estimates that those living in the most sprawling areas spend an additional $5,000 per year on vehicle costs compared to those in the most compact. The upshot is that sprawl costs America an astounding $4,500 annually per capita. 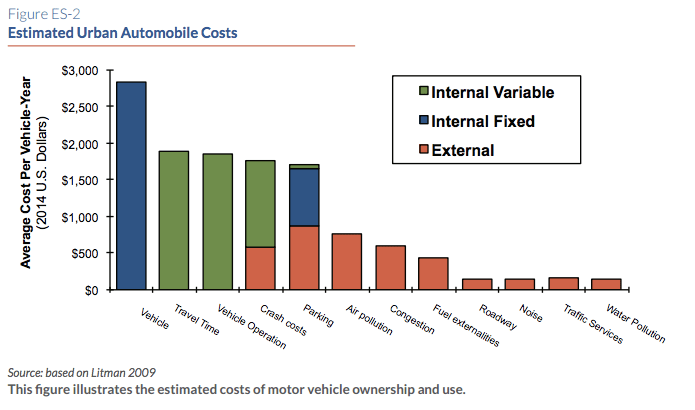 Of those costs, about $2,500 are borne by consumers — like car maintenance or higher tax bills. Another $2,000 or so is external — costs to society — like increased air pollution, or reduced economic mobility. Researchers also discussed some possible benefits from sprawl, like lower land costs and bigger yards, but noted that they mostly accrue to people who live in sprawling areas and may be offset largely by negative impacts on those who don’t. Authors note that the report may underestimate the costs of sprawl because it does not attempt to quantify some negative outcomes, like reduced open space, reduced accessibility for non-drivers, or reduced economic productivity, though many researchers consider those costs important. In light of the findings, New Climate Economy suggests some specific fixes that can help communities promote smart growth and save money. They recommend communities eliminate minimum parking requirements. They also recommend imposing impact fees on sprawling development that can help the public recover some of the shared costs of sprawl. One issue with such a figure, even if it’s right, is that the densest areas have high housing prices thanks to zoning laws – city living is not as inherently expensive as statistics would suggest. Manhattan, Boston, San Francisco all drive up the densest portion’s average presumably. A car alone costs on average $9k a year, according to AAA. I tend to take studies like this with the proverbial “grain of salt”. And the “cost of sprawl” would be of more concern to the average American if he or she had to write a check for $90 every week, or (even more attention-getting) peel off four $20 bills and a ten every Friday. How many American suburbanites really want to give up their single-family houses and yards to live in an urban apartment? I think the term “density” scares some people–it brings up images from the Bettman Archive of teeming tenements on the Lower East Side of New York back in 1900. The graph suggests that lane miles per square mile are nearly constant. 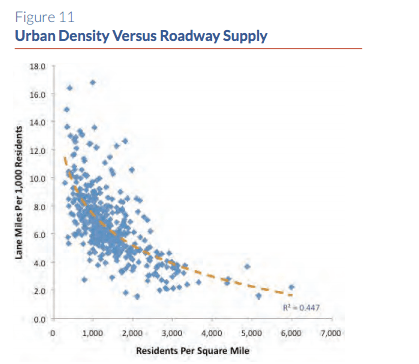 On the right that’s probably due to a standard street grid, but I’m curious if the supposedly less dense areas have a minimum density of roads due to the longer trip distances, ie the need for lane miles per person goes up as fast as density goes down. Thankfully the benefits of suburban living far outweigh the costs. Oh, and I do pay for this every year when I pay my real estate taxes. I am glad this one is solved. Next? Well you know, unless you actually read the above article. Specifically that you don’t pay the costs, and also, that the benefits likely don’t outweigh the costs, if you had to pay them. The thing that’s missing here, is density doesn’t mean highrises, you can have dense suburban neighbourhoods, with smaller yards, mixed with low rises and town houses. This is where I live and it really has all the benefits of sprawling developments, and less grass to cut. What are these benefits of suburban living? Do tell. Yes, I suppose the spelling gives it away. I live in Kitchener, which is a fairly car centric midsized (for Canada) city in Ontario. Its currently undergoing a moderately aggressive densification, with substantial infill development targets, along with implementation of a new LRT system. Although, the city is still quite sprawling, there is a fairly dense and walkable core, which is seeing a large number of highrise developments, but there are a few area’s which have more midrise, and dense single family/duplex housing, which is where I live. However at least my area, has rather limited access to important services like grocery and shops, although I’m hoping that the transit expansion will improve this somewhat. You’re definitely right, the streetcar suburbs are classic examples of medium density walkable neighbourhoods, the kind of which weren’t really haven’t been built for a long time in North America.